Supply chains must continue to meet the challenges and everyday pressures that als have existed—reducing costs, demanding higher quality, improving lead times and responsiveness, and reducing risk. • Improve supply chain visibility. • Focus on risk management. • Develop/align the supply chain organization and talent. According to a recent poll by Gartner, Inc., an information technology research and advisory company, supply-chain visibility and event management is the top supply-chain management application for 2014. However, the adoption of supply-chain visibility by most manufacturers has been slow, despite the desire to move in this direction. The goal should be to obtain visibility into key data sets that span across the extended supply chain, in a timely or real-time basis. Achieving this level of visibility is a precursor to the next area of focus—becoming more agile and flexible. Supply-chain agility is recognized by most as a critical priority to overcome today’s supply-chain management challenges. However, oftentimes the very initiatives organizations undertake to either compete globally, respond to customer demands or reduce costs can lead to inflexibility. For example, consider a manufacturer that decides to reduce costs by outsourcing some of its production, engineering or logistics functions. This equates to loss of control, and as the organization gives up control, it becomes less flexible. This in turn hinders its ability to respond quickly to changes in its internal or external environment. Supply-chain agility refers to an organization’s ability to quickly adjust its plans, tactics and operations within its supply chain, to respond or adapt to changes in its environment. 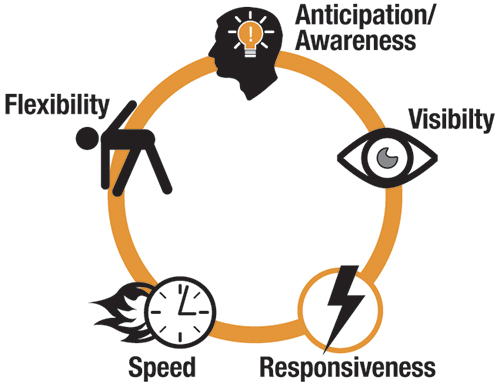 Transforming into an agile supply chain requires attention in five essential areas (see the accompanying sidebar): anticipation and awareness; visibility; responsiveness; speed; and flexibility. The focus on globalization and intense cost reduction is increasing the risk in today’s supply chain. Manufacturers must find the right balance between taking on additional risk while pursuing cost reductions. Supply-chain agility requires enhanced critical thinking and decision-making skills. Organizations now are being more deliberate with their approach and strategies when determining what should be offshored, near-sourced and onshored. Consider the automotive industry, where 30 percent of the global volume in the industry currently is on a multi-continent platform. By the end of the decade, that percentage will grow to 50 percent. Today, the mid-Mexico region is a hotbed for new-vehicle production capacity as OEMs seek to reduce logistics costs, inventory and, ultimately, risk. The investment by OEMs in mid-Mexico has in turn created pressure on motor-vehicle parts suppliers to grow their capabilities in this region. The challenge will be to balance the additional risk they’re taking on due to global expansion against their changing customer requirements. Supply-chain risk management describes an organization’s ability to manage and respond to risks along the supply chain, to ensure the continuity and consistency of flow. Supply-chain risks can be internal (supplier shortage or production failure, cost increases, change in demand or customer preferences, etc.) or external (natural disasters, economic shifts, political issues, resource availability, infrastructure failures, etc.). However, there are opportunities to mitigate and avoid these risks. First, identify all of the sources of possible risk. Second, assess the likelihood and impact of each risk. Third, develop mitigation plans for each type of risk, and include supply-chain partners in these developments. Finally, define and implement a process to monitor supply-chain risk, using visibility tools, metrics and scorecards. Effectively managing your supply-chain risk can be a competitive advantage, and can quickly have the reverse effect if you’re not prepared when a disruption occurs. Managing today’s supply chain requires a different approach to developing and aligning an organization and its talent. Complex end-to-end supply-chain management requires a move a from a typical organizational silo approach as the supply chain evolves. As broader and deeper skills are required; the challenge becomes finding and retaining talent. Key attributes of the future supply-chain professional include end-to-end supply-chain knowledge and experience, dynamic leadership, strong analytical and technical skills, business savvy and the ability to adapt and respond to change, among many others. Moving a from a silo structure to one that can manage the end-to-end supply chain improves coordination and collaboration—within and outside the organization. It also helps reduce costs and improve organizational efficiency. A step in the right direction: Start by aligning management and the goals and objectives of the supply-chain functions. Organizations often take the silo approach when establishing metrics, which can result in competing objectives and an overall negative for the company. When establishing the aligned metrics, ensure you’re taking a total-cost approach. Visibility is fine - It is the accuracy of the data that is problem. We see bad data and that causes major challenges (especially risk) in the supply chain.